Posted on November 12, 2013 by Richard Masoner. On a sunny Wednesday morning as moms, kids and workers walked along Halsted Street, a bike thief worked in plain sight. “Sucker poles” are what Howard Kaplan of the Chicago Stolen Bike Registry call these sign posts that are not securely attached to their base. In San Jose, I’ve seen bike racks that are similarly attached only loosely to the sidewalk with bolts. I’m told this tactic is used by thieves elsewhere around the Bay Area and in Santa Cruz. When locking up your bike, check to ensure the bike rack or post you’ve secured your bike to is itself securely attached. 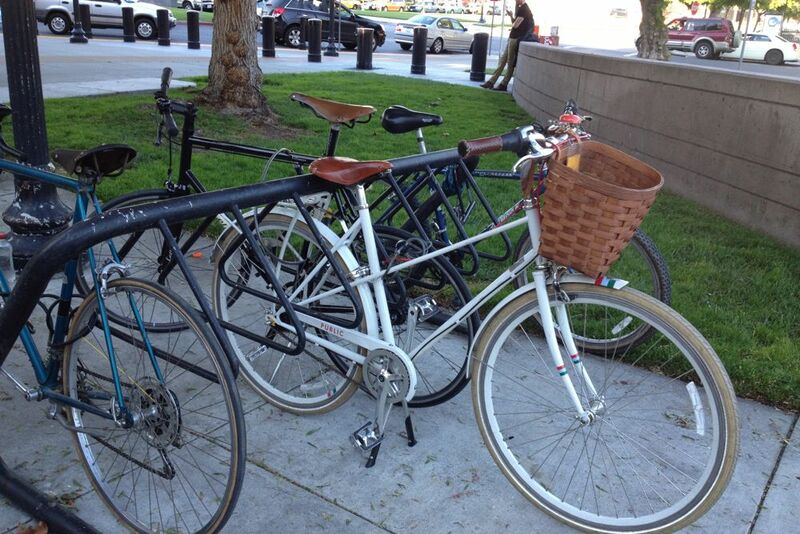 Read more –> Bike Theft Gangs Using ‘Sucker Poles’ to Steal Bikes Across the City. H/T to Jenny Oh. Local opinion columnist Scott Herhold had his bike stripped while it was locked up at Diridon Station in San Jose. I’ve always believed that my 30-year-old Nishiki bike offered an effective poison pill to the bad guys. The paint is chipped, the seat is frayed, and the gears look ancient. I thought no self-respecting thief would look twice. I had reason to think it would be no problem. When thieves broke into the bike enclosure at San Jose City Hall a couple months ago, they stripped several bikes of wheels and seats but left mine alone. Stealing something from my bike is like robbing a cane from a grandmother. Guess what? Some thieves don’t mind stealing from grandmothers. When I stopped by the station to pick up my bike, both my wheels were gone — rims, tires, the works. My Nishiki lay like a pathetic skeleton on the ground. Herhold uses the opportunity of his stripped bike to discuss the police union politics of next year’s San Jose mayoral race. Read more in the Mercury-News: What a theft from a bike says about San Jose crime. Doesn’t help that Diridon has awful bike racks that make it close to impossible to adequately secure the frame + both wheels. These Cora style racks are my absolute favorite! Very easy to secure a fendered wheel and frame with a u-lock. You like them better than “staples” style racks that let you lock both wheels? Yep. Easier to secure the entire back half of the bike w/ Cora. Front wheel isn’t any harder than staple rack. With the odd build of my folding bike locking to nearly any “normal” bike rack is difficult. I pretty much have to lock to the end of the rack and it still requires use of a cord and U-lock. to fully secure. Even when I am fully secured I still take my seat with me rather than locking it, that way my toolbag of tools is with me as well. Never take chances, it took a thief under 5 minutes to make off with my seat from right in front of the busy Trader Joes in downtown Santa Cruz. Speaking of stripped and stolen bikes…I was recently reviewing BARTs performance reports which list them (last page) on a quarterly basis…I’m not sure how they came up with the overall acceptable goal of 150? I think two, is too many! 176 bike thefts for current quarter, up 29 from last quarter and down from the corresponding quarter of the prior fiscal year. 147 bike thefts for current quarter, down 42 from last quarter and down from the corresponding quarter of the prior fiscal year. 189 bike thefts for current quarter, down 44 from last quarter and up from the corresponding quarter of the prior fiscal year. 233 bike thefts for current quarter, up 24 from last quarter and up from the corresponding quarter of the prior fiscal year. The goal might seem unreasonable, but that a transit agency even tracks bike thefts is a big step in the right direction so we can at least evaluate the problem.